The first ascent of Pokhalde peak was in 1953 via Kongma La along its north ridge by John Hunt and his Everest Expedition Team. The peak looks like a crenulated rocky ridge dominated by the huge bulk of Nuptse. 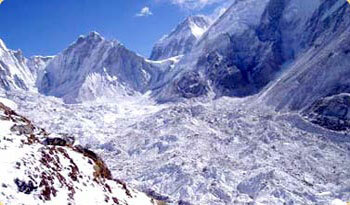 The peak has small glacier, which is best reached along the ridge rising from the Kongma La, on its northern side.